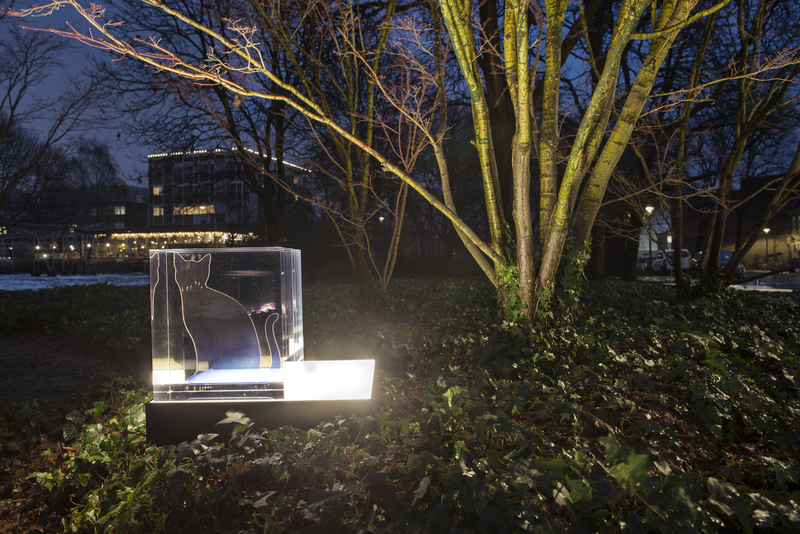 For his installation The Garden of Schrödinger’s Cats (2017), Takeo Sugamata researched the fascinating interpretation of light in quantum mechanics. According to this theory, light is assumed to consist of waves and in others to consist of individual particles – it is unclear what it really is. Sugamata finds it surprising that we actually know so little about something that surrounds us every day. The famous thought experiment devised by Austrian Erwin Schrödinger in 1935, Schrödinger’s cat, illustrates this uncertainty about the things that make up our universe. He suggested putting a cat in a box with a tube that contained a radioactive substance. After an hour, during which a small particle of the substance is released, a sensor will notice the radiation and drop a hammer on a bottle of poison – as a result, the cat dies. But it is also possible that no substance is released at all, whereby the bottle of poison stays intact and the cat lives. You don’t know which one of the two scenarios is true unless you lift the lid of the box to see if the cat is dead or alive. According to the (absurd) laws of quantum mechanics, the cat is both dead and alive as long as the box is covered. The cats of Schrödinger can now be found in Sugamata’s garden. They depict the dual character that light, according to quantum mechanics, has: sometimes light is reflected and sometimes it is broken to make visible the many colours of the spectrum. 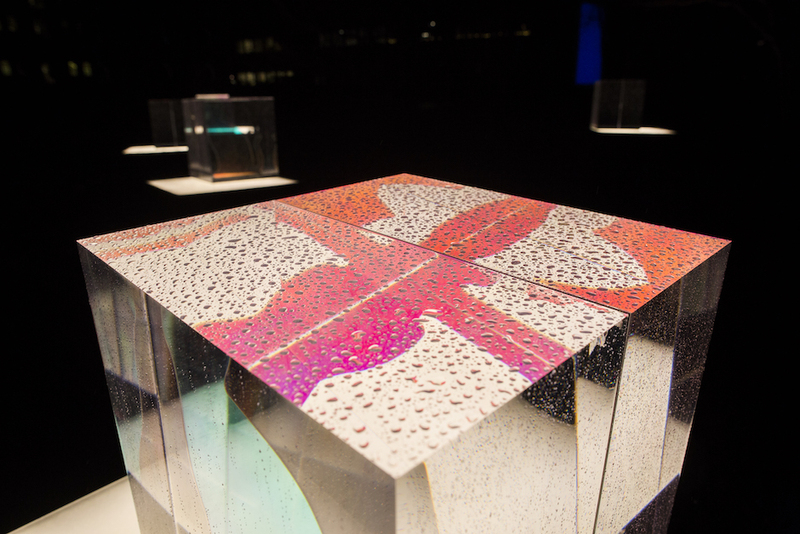 But with his installation, Sugamata also wants to show that the distinction between life and death and between existence and non-existence is not as clear as we may think. Can you tell, with all the reflections, shadows and colours, which cats are alive and which ones are dead? Or are they sometimes both at the same time? Takeo Sugamata (1977) studied architecture in Tokyo in his home country Japan but moved to Singapore after graduation to work for light design studio Lighting Planners Associates. In 2010 Sugamata decided to start his own studio, SWITCH, in Singapore, and has been working on lighting designs for both indoor and outdoor spaces of homes, offices, hotels, restaurants and shops since. 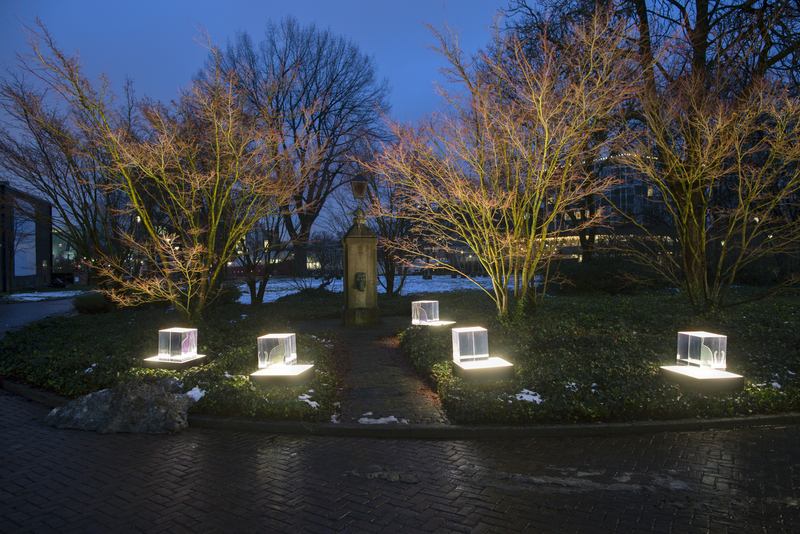 He also creates temporary light artworks and installations while drawing attention to the problems caused by light pollution in his work Wish upon every shooting star.